Every serious angler knows the value that quality hooks add to a lure. Whether you’re throwing topwaters, crankbaits, suspending twitch baits, or any other lure, the hooks play a pivotal role in getting the fish to the fisherman. They need to be strong, durable, and sharp in order to do the job they were made for correctly, and unfortunately, many of the stock hooks that some lures come with don’t quite live up to their expectation. They rust, or they bend/break, or often become dull after only a few trips to the salt. The above mentioned factors are all good reasons to change out the hooks on most of your new lures before hitting the water. This cost friendly task only takes a few minutes of your time and will help ensure that you don’t lose that fish of a lifetime or miss out on big money during a tournament. A few things you should consider before purchasing your new hooks include brand, size, and whether to stick with trebles, or replace them with singles. 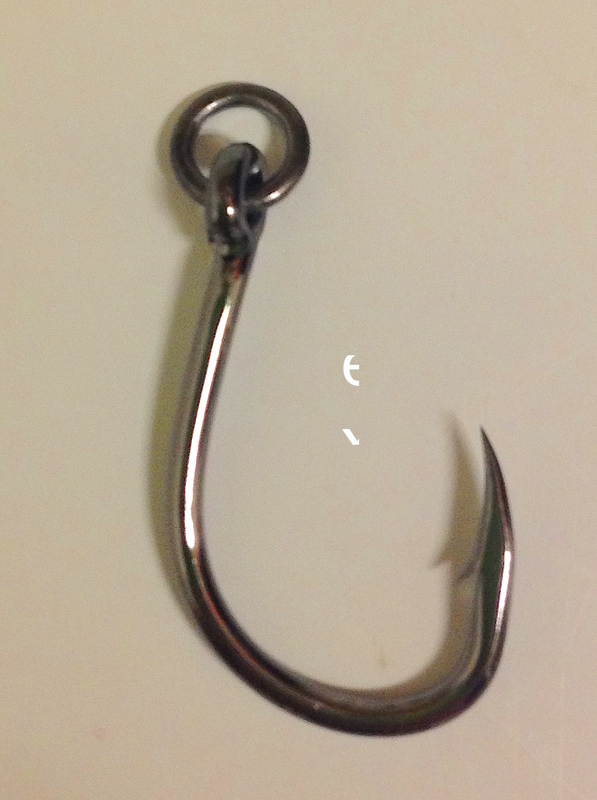 Before worrying about what brand or size of hooks to get, you should really ask yourself if you want to stick with treble hooks, (similar to the ones the lure probably came with) or if you should make the switch to single hooks. To answer the question that’s going through your mind right now, no, your hook up ratio will not suffer by making the switch. Ask some of the top anglers or guides that have made the switch, and they’ll confirm it. 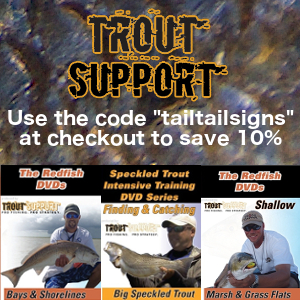 Not only will you hookup with just as many fish as before, you’ll also benefit in several other ways as well. For starters, single hooks work great when fishing around grassy areas. Whether the grass is just below the surface, or small pieces that have broken off are floating through the water, single hooks fail to hang up as much since the grass passes right around them. This gives you the option to throw a topwater lure around certain areas where you probably couldn’t before. Another problem with treble hooks is that they tend to hang up with everything in sight. Clothing, nets, and fingers are three things they seem to catch other than fish, and they can be a pain to remove. Just about the time you get one hook out, another seems to grab a hold of something else, which starts the process of removing it all over again. With single hooks, you are working with two sharp ends instead of six, which lowers the odds that the business end of the hook grabs a hold of your gear or body parts. This holds true for the fish as well. Treble hooks can do some real damage to a fish that you intend to release if they end up in their eyes, body, and/or gills, which in some cases, can lower the odds that they will survive. Anglers that practice catch and release the majority of the time have become big fans of single hooks of this reason. If you’ve decided to make the switch to single hooks, you’ll need to make sure you purchase the right style of hooks. Short shank live bait hooks with rings are your best choice, because they will require the least amount of work when attaching them. The short shank prevents the front and rear hooks from tangling with each other and the included ring prevents you from having to add an additional one to ensure the hook faces the right way. 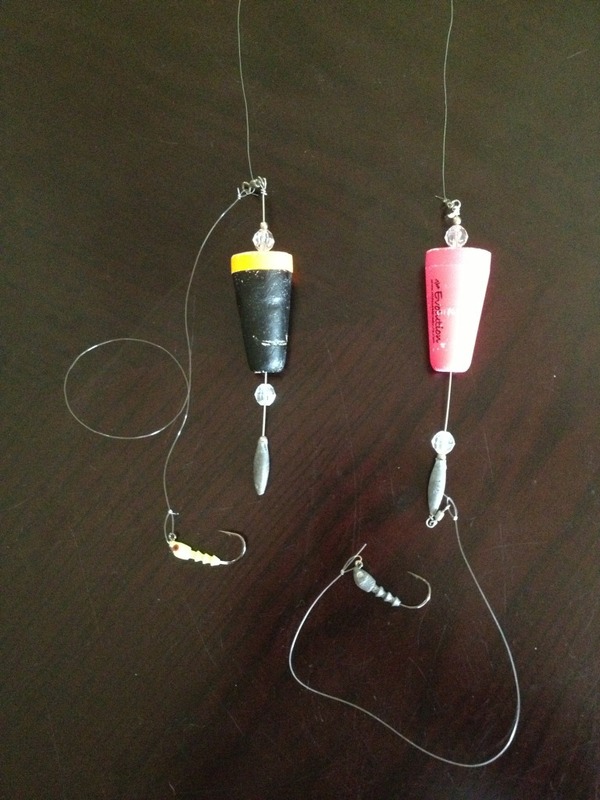 Without two rings, the hooks will face sideways instead of running in line with the lure. When it comes to brands, some companies have proven themselves to be reliable makers of quality hooks. When you hear names like Owner, Gamakatsu, and Lazer TroKar, you know that you’re using some of the best hooks money can buy. Sure these hooks may cost a little more than others, but they will probably outlast most of your lures by resisting rust, staying sharp, and holding up to some of the biggest fish in the bay. For those looking for something a little more cost friendly that will get the job done, the VMC hooks from Rapala have served me well. As far as strength goes, they do a great job of holding up to the abuse big redfish dole out and keep a nice sharp point for the better part of a year. They will require you to replace them about once a year, due to eventual rust, but you definitely get your money’s worth out of them. Size can be tricky when it comes to hooks, depending on whether you are sticking with trebles or replacing with singles. The hooks that come with the lure were chosen for a reason, so careful consideration should be taken when replacing them. One of the main things to consider is the size/weight of the hooks. 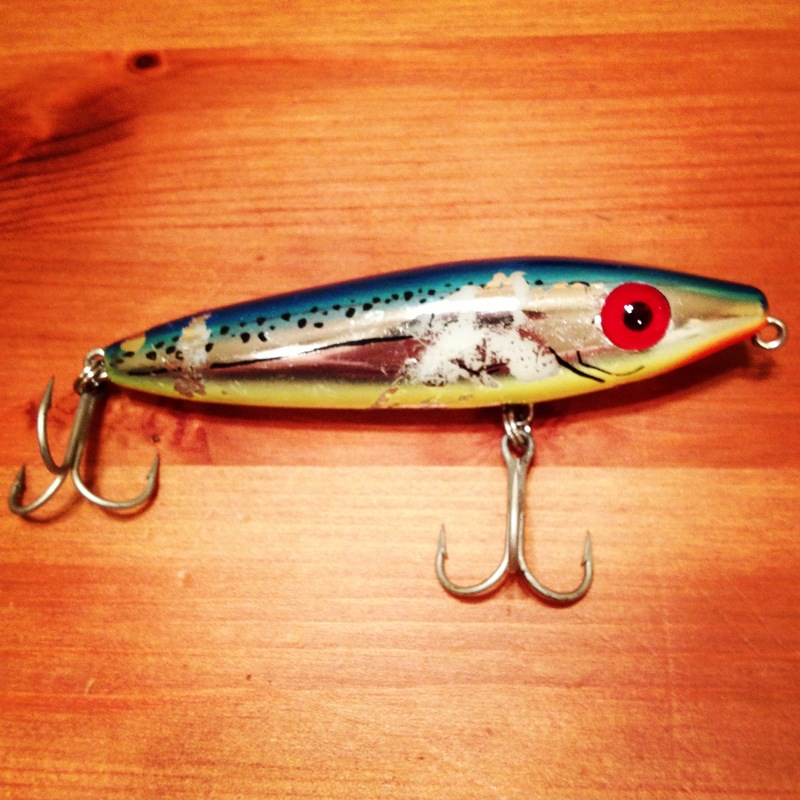 Without the correct weight, the balance of the lure can be thrown off, causing it to not function properly. Most full sized topwaters like She Dogs, Top Dogs, and Skitterwalks, require #2 trebles. If you decided to go with single hooks, a 3/0 hook on the front, followed by a 2/0 hook on the back makes a great combo. 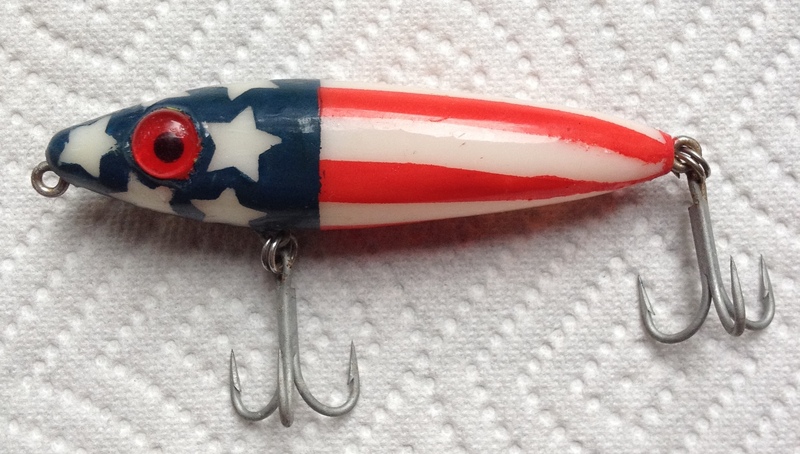 By placing the smaller hook on the rear, you provide the lure with a little more freedom, which increases it’s action. 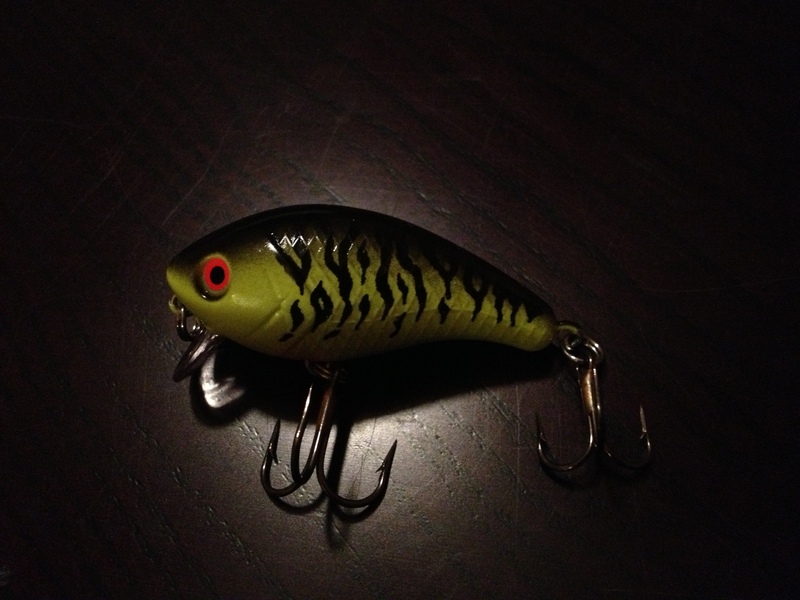 For smaller topwaters like the Super Spook Jr, and MirrOmullet, #4 trebles or 1/0 singles work well. 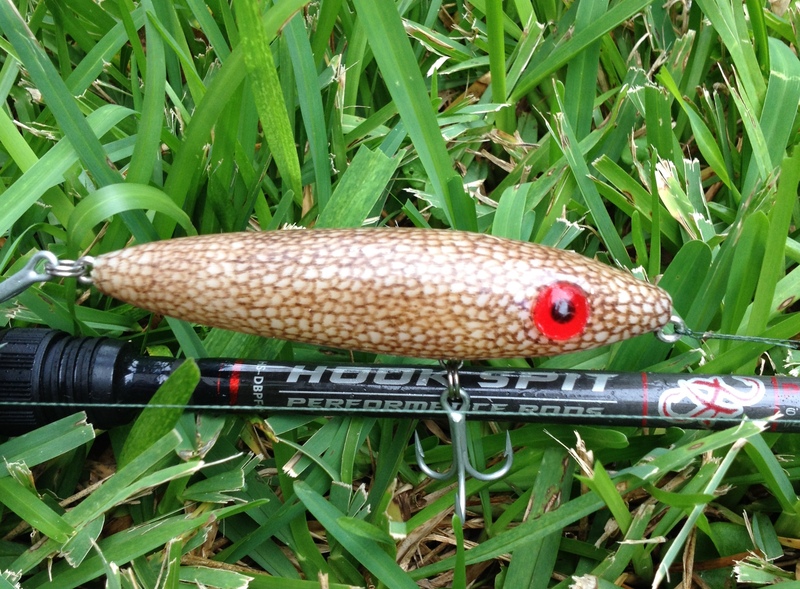 For even smaller crankbait type lures like the Strike Pro Hunchback or Manns 1-Minus, you’ll want a #4 treble on the front with a #6 on the rear or a 1/0 single hook on both the front and rear if you decide to go that route. Changing out hooks takes no time at all and only requires a pair of split ring pliers to do so. It is possible to complete the task without the pliers, but you’ll spend more time doing so and probably poke your fingers a few times during the process. Treble hooks are easy to change out because all they require is for you to remove one, and add another. Single hooks aren’t quiet as simple because they can either face the front or the rear of the lure. Many anglers claim that the direction they face when you add them is very important, depending on the type of area you fish. If you are fishing around lots of heavy grass, facing both hooks towards the rear will help keep your lure grass free, while having the front hook facing the front and the back hook facing the rear is said to help with your hookup ratio. As far as direction and hookup ratio goes, the jury is still out on that one. Whether you decide to stick with trebles or try out singles, changing hooks on your lures is a cheap and easy way to make them more dependable while on the water. Doing so might help to save you from a few sleepless nights, while you lie in bed, thinking about the one that got away. Grant and I had a pretty good day of trout fishing with a few reds thrown in the mix. It had been a while since we’d had a chance to get together to chase fish so with Grant just getting back from a week in the Bahamas, a trip together was long overdue. We decided to head down to the Matagorda area since we hadn’t been in a while. We met up at 5:30 am, unloaded the kayaks, and launched into the dark. We made our way to the first area we planned to fish and found plenty of trout. They had bait pushed up against a wind blown shoreline and were constantly darting through which sent them scattering in every direction. We both started off by throwing topwaters with a few blowups that didn’t connect. I switched over to one of my new Hydra Buggs and immediately hooked up with a solid 18 inch speck. Grant was needing to restock the freezer so on the stringer it went. I picked up another couple trout in the same area and all of a sudden they were gone. Grant landed a couple trout as well on his Skitterwalk and we decided to move into a small cove since the trout bite had died. I spotted a few reds crawling through a combination of grass and moss so I decided to see if I could pick a few of them off while Grant stayed in slightly deeper water. Sight casting the reds was more difficult than usual because as soon as the lure hit the water it was covered in the moss. I managed to pick up two reds by casting past the grass/moss and burning the Hydra Bugg past the fish and hoping for a reaction strike. Grant managed a couple of reds and lost a another trout or two as well. We decided to try our luck in slightly deeper water to work a few reefs for trout again. At this point Grant could do no wrong and I could not do right. He had plenty of blowups and landed another five specks up to 23″ while I couldn’t even get a nibble on my She Dog or Hunchback. We ended the day with a combined 10 trout between 17 and 23 inches and four reds in the lower to mid slot. All of Grant’s fish came on his Pink Skitterwalk while mine came on a Chained Beast Hydra Bugg with a white tail. I also tried a Bone colored She Dog and ate-o-ate colored Hunchback with no takers. It was a fun day on the water with a nice meat haul for Grant. 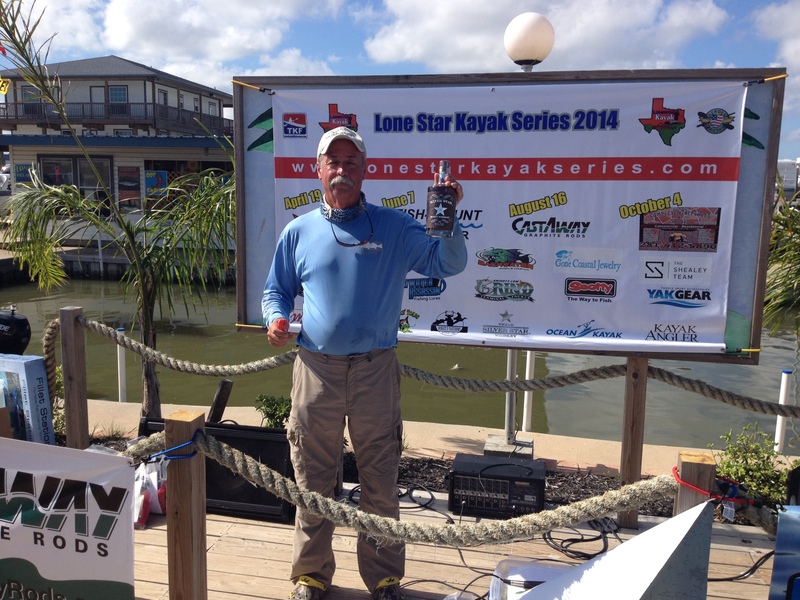 Yesterday was the 2nd event of the 2014 Lone Star Kayak series in Galveston, TX. One of my friends (Jared) and I decided to fish together since we had both planned on going to the same general area. I’ve fished this spot many times in the past and have always had good luck when the conditions are right. After checking tide charts, weather, and wind direction/speed all week long I had come to the conclusion that our little marsh we were heading to should hold some decent fish. Tides have been running about a foot higher than predicted for more than a week now which meant I would be choosing an area with really shallow shell and mud. This cut my list in half on places I had been considering. While some areas produce well on really low tides, this spot is without a doubt a high tide marsh. The small lakes we would be fishing consist of soft knee deep mud and a ton of shell. When tides are running as predicted the shell will sit 3-5 inches below the surface on a high tide and will be completely exposed on a low tide. On this particular day we were fishing during the peek of the high tide which was running about 8 inches higher than predicted. This put the shell a foot or more below the surface of the water allowing us to float over it along with giving the redfish access to cruise the top of it looking for food. Because of the depth and amount of shell our lure options were limited. I rigged my rods the night before with a popping cork, topwater, and soft plastic. I figured the popping cork would be used for the majority of the day with an occasional toss of the topwater. The soft plastic was available incase a pod or tailing red was spotted and something to sight cast with was needed. 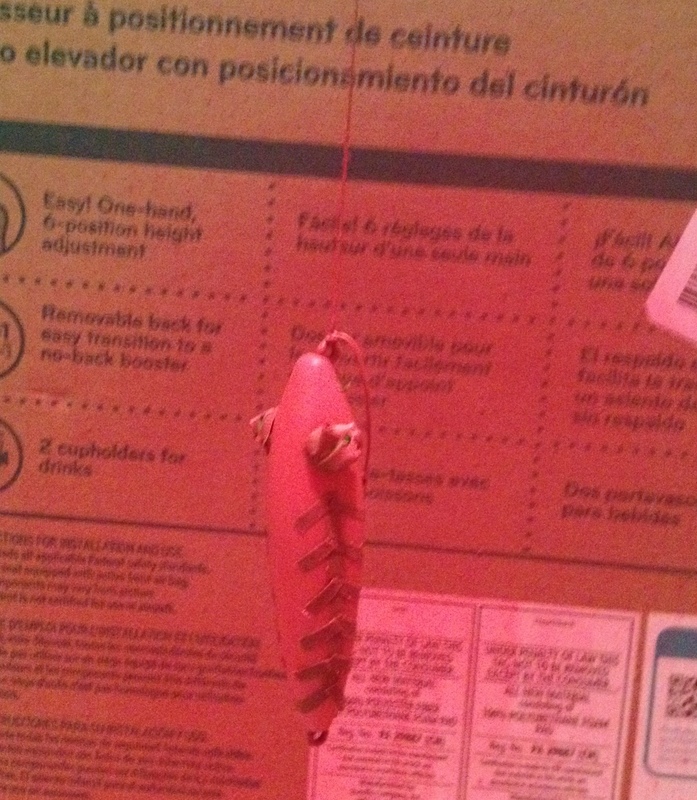 Other than that it would not be used for fear of hanging up on the shell. 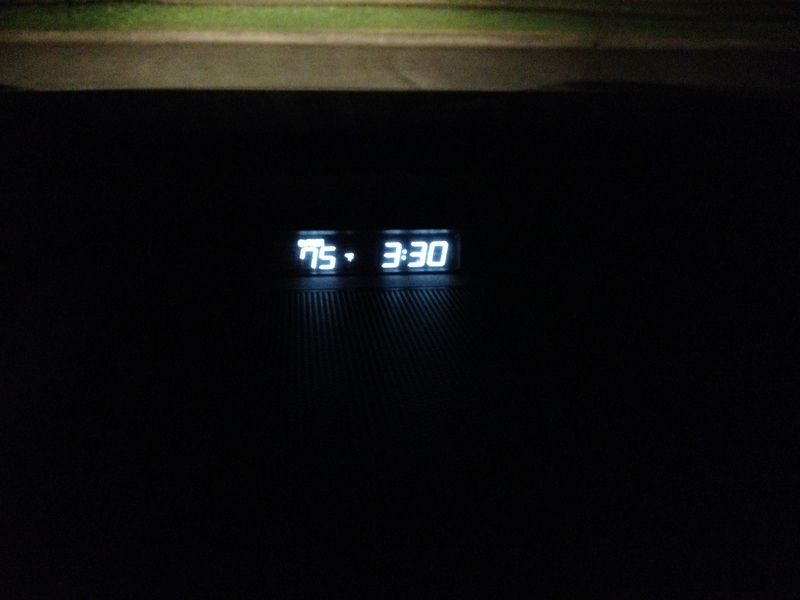 My alarm went off at 3 am and I was one the road by 330. Jared and I met up at McDonalds and after grabbing a quick bite to eat we headed for the launch. We arrived around 5:30, unloaded the kayaks, and sat around for the next 20 minutes waiting for 6 am to arrive per tourney rules. At 6 am on the dot we pushed off and headed straight for the first lake I wanted to fish. The majority of the fish I’ve pulled from this spot have been 25+ inche fish so I was hoping they would be around today. After a 15 minute paddle we were in the first lake and started casting. 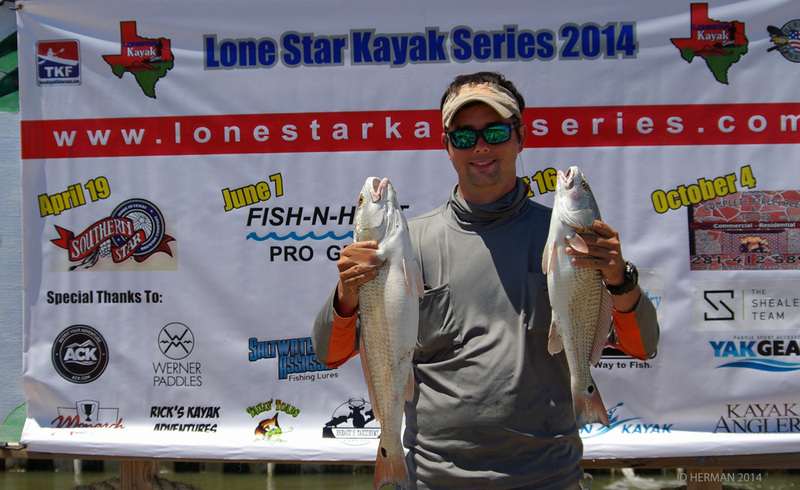 Jared threw his popping cork around the drain leading into the lake and picked up a 19″ red within the first 5 minutes. 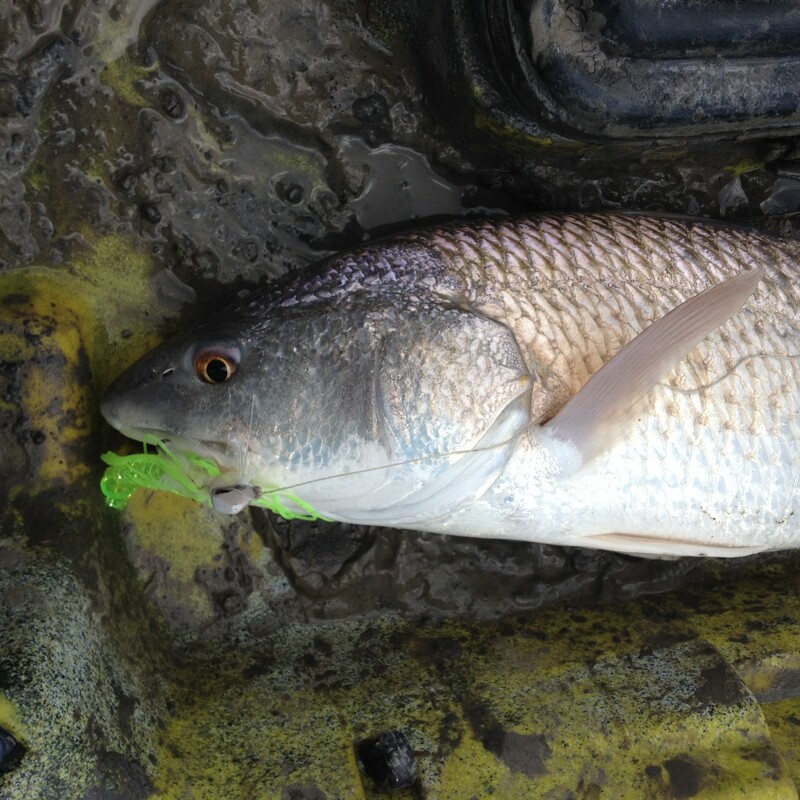 I spotted a red crawling around a small island and reached for my rod with the Chicken Boy Shrimp (Red Shad). 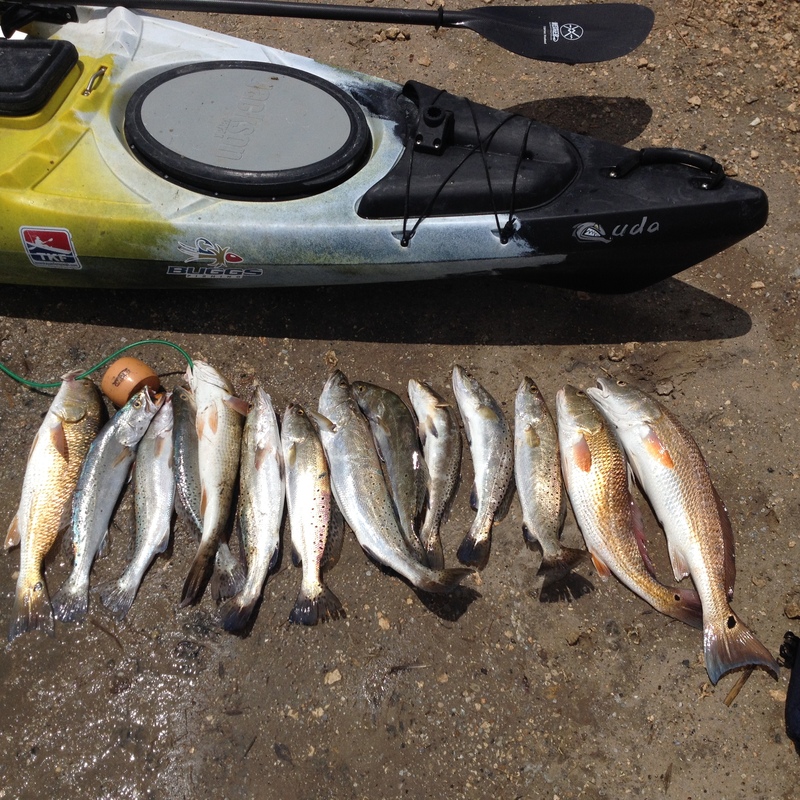 While trying to get within casting distance my kayak scraped some shell and sent that fish running. I threw my Midcoast Popping Cork (Evolution) around the area where I had seen the fish but didn’t seem to have any luck. I decided to move away from the drain and fish the shell covered lake I had come for. The water wasn’t quiet as high as I’d hoped and as a result my popping cork would hang up on mounds of shell that sat higher in the water column. After hanging up 5 times in 10 casts with no fish to show for my trouble I decided go with the topwater. I knew this would keep me from hanging up and would be a great way to cover some water. I started off throwing a MirrOlure She Pup in the woodpecker color (red head, white back, chrome belly). On my 3rd cast I had a nice little blow up that didn’t connect. Five casts later I had another that did connect and the fight was on. However, the fight was short and resulted in me reeling in my line without the lure. When getting ready the night before, the thought never crossed my mind that I should tie on a leader connecting my lure to my braid. This was mistake number one of the day and costs me what might have been a good fish. The break off occurred 5 seconds after hooking up so I never really got a good feel for the fish. My other mistake was not getting my rod tip high enough to help keep the line out of the shell. To make matters worse I think the fish swims by my kayak to laugh at me. You’ll see the big wake at the end of the short video below. I was disappointed in my mistakes but quickly tied on another she pup (black back, chrome body, orange belly), this time using about a foot of fluorocarbon leader to help deal with the shell. I began fan casting the small lake once again working the lure very quickly since thats what they wanted and after a few missed blowups I had my second hookup of the day. I made sure to keep my rod tip high and even stood up in the kayak when I had the chance. I wanted to make sure this one had no chance at cutting me off. After a short fight I landed my first fish of the day that weighed in at 5.56 lbs measuring 24 1/4″.In the video below you’ll see the fish bite on the pause as I move the rod from right to left. I had a fish on my Grind Terminal Tackle stringer early which is always a good feeling on tourney day. I continued to work the area the same as before but the fight with the previous fish must have spooked the others. After a while we decided to move on to the next lake. This lake was similar to the first one which meant it was very small, full of shell, and had enough water covering it to allow us to barely move over the top without scraping. As we neared the lake traveling down a small channel I began seeing mud boils in front of my kayak. This was a definite sign we were spooking reds that had just been sitting in front of us. I drifted over to a small island and started fan casting the edge of the lake while Jared took a separate channel 15 yards away that led into the same lake. On my first cast I had a good blowup that missed, 2nd cast produced the same thing, so did the 3rd and 4th casts which had me thinking smaller reds must be hitting my lure. On the 5th cast that theory was proven wrong. A nice upper slot red clobbered my lure and took off with it peeling off 15 yards of line before turning sideways. While it was running I was able to get out of my kayak and stand on the island I had been sitting next to in order to give me a higher platform to keep my line as far above the shell as possible. For the next 45 seconds the fish ran away from me pulling drag or moved side to side never allowing me to gain any line back. Jared watched from about 20 yards away as I was telling him how solid this fish was when all of a sudden my line goes limp. 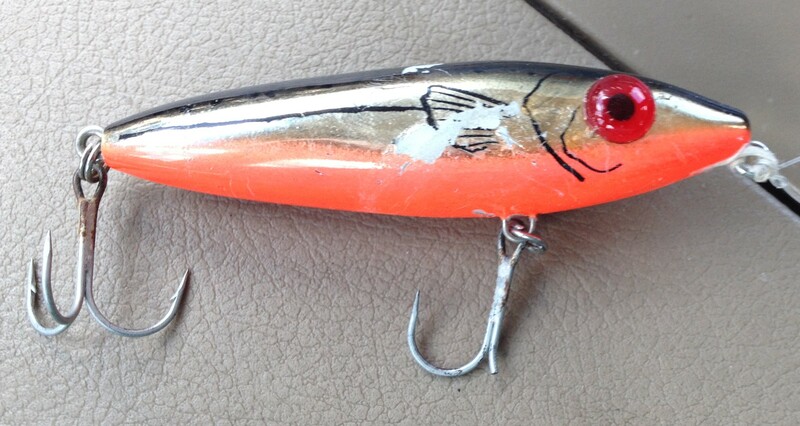 I reel in my lure and soon as it comes out of the water I see that two of the hooks on my front treble are missing. After a few minutes of non stop cursing my lure I realized I was partially to blame. 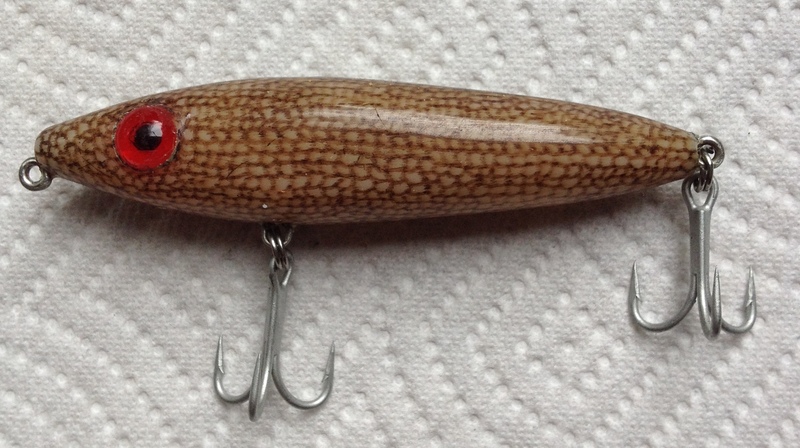 I switch out the majority of my hooks with VMC hooks for the added strength but had failed to do so on this lure. That was mistake number 3 on tournament day. 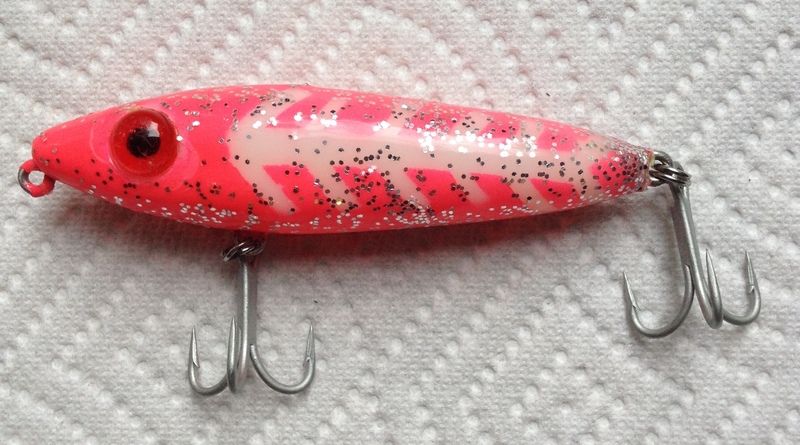 I tied on my third topwater of the day sticking with the She Pup, this time going with hot pink with a chrome body. I seemed to be getting more blowups then Jared who was throwing a Rapala Skitterwalk so I didn’t want to change what was working. As I was tying on this lure Jared hooked up with a nice fish. He landed it as quickly as he could in hopes that he wouldn’t spook the other fish in the lake. His fish went close to 26″ which meant neither of us would show up to the weighin empty-handed. I finally retied my lure and five casts after the broken hook incident I started getting blowups again. I had three that didn’t connect so I decided to slow down my retrieve just a little and that was the ticket. I had just said to Jared, “I’m going to try a medium retrieve” and the fish hit as soon as the last word came out of my mouth. It ran straight towards me and I could barely reel in fast enough to keep up with it. When it got within five feet of my kayak it turned to run away but the fight was over by then. I landed the fish within a few seconds watching my lure fly out of its mouth just as I slid the net under it. That fish went 22 1/4 inch weighing in at 4.40 lbs. Neither fish was great but I had two for the weighin which takes a lot of pressure off anyone on tournament day. We worked the lake for another 30 minutes but the fish had left the area. We were finding good amounts of fish but the size of the lakes made it difficult to stay on them since a couple of hook ups would spook the rest. We decided to head to the first lake we had fished to see if they had returned after a short break. We covered the lake well but had no blowups or luck so we moved on to the third lake. This lake, which was the largest of the three and had the same features as the first two so we were hoping for similar results. We each chose a shoreline and started crab walking our kayaks parallel with the shoreline staying about 10 yards away from it. We had multiple blow ups while covering the area with no hookups. Finally Jared caught his 2nd fish of the day which went 20 1/2 inches and gave him two fish for the weighin. We continued working the shoreline with more blow ups that just wouldn’t connect. I eventually hooked up with another red that again, cut me off on the shell after a 5 second fight. I was still using my fluorocarbon leader but somehow the fish was able to slide the braid part of my line across the shell and cut it above the leader. After a few minutes I spotted my lure which the fish shook free and paddled over to get it. I had already tied on my forth top water of the day so in the milk crate it went. The wind had kicked up a little by now so I went with the She Dog instead of the pup for a little more noise and splash. I missed another fish as I sat my rod down to secure my paddle which was about to fall off my kayak into the water. I had just made a cast and twitched the lure about 6 times when I sat down my rod to grab my paddle. Two seconds later I hear a huge splash and look up to see my lure missing and my rod being pulled over the side. I dropped my paddle and grabbed my rod and start reeling in only to find out he had already spit the lure. I connected on a another fish 15 minutes later that I never saw. Something had blown up on my lure and disappear under the water. I set the hook and began pulling the fish towards me. I could feel the tension of the fish on the end of the line but it never made any hard runs. As it neared my kayak it turned away and slowly peeled off 5-10 yards of line and began moving sideways again at a slow speed. It finally took off peeling another 10 yards of line from my reel before the hook came flying back at me. I was completely dumbfounded and all I could do was look at Jared and laugh because it was just one of those days. He suggested that it was probably a big flounder and after thinking about it he was probably right. I would have loved to have gotten a look at it because it was going to be a nice flounder if thats truly what it had been. We decided to head back to the truck and make it to the weighin early. It was hot, we had two fish, and it would be nice to arrive early and visit with everyone. We also wanted to make sure we got our fish there alive for two reasons. You get a 1/2 lb bonus for a live weighin, plus a raffle ticket for each fish released alive for a drawing later in the day for a Werner Paddle. We headed for the weighin and arrived around 1:45 which put us there 15 minutes before the scales opened up. We talked with a few others that had just arrived and collected our captains bag full of some free gear from sponsors such as Yak Gear and Bass Assassin. We were 4th in line to weighin our fish with the eventual champion Joshua Majorka weighing his in 1st. Jared weighed his fish in before me and had 9.55 lbs including his 1/2 lb bonus. I weighed my fish next and to my surprise had 10.46 lbs with my 1/2 bonus. I didn’t expect to be in double digits with a 22 and 24 inch fish but both were decently plump. We spent the next two and half hours eating a Louis Bait Camp Burger and visiting with old and new friends. Before announcing the winners we always have several dozen drawings for all kinds of goodies provided by the growing list of sponsors. I had my number called at one point and received a nice little prize package that included a Dexter Knife, Plano Tackle Tray, MirrOlure She Dog, and Saltwater Assassin soft plastics and popping corks. My good luck at the weighin didn’t stop there. 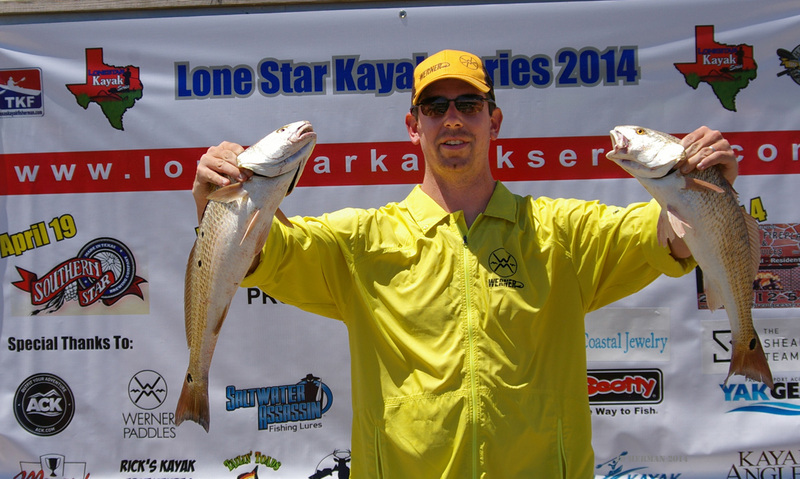 Aside from awarding the anglers with the heaviest stringers, the LSKS also gives away a prize package for the closets fish to 21″ without going over (Blackjack) and for the fish with the most spots. 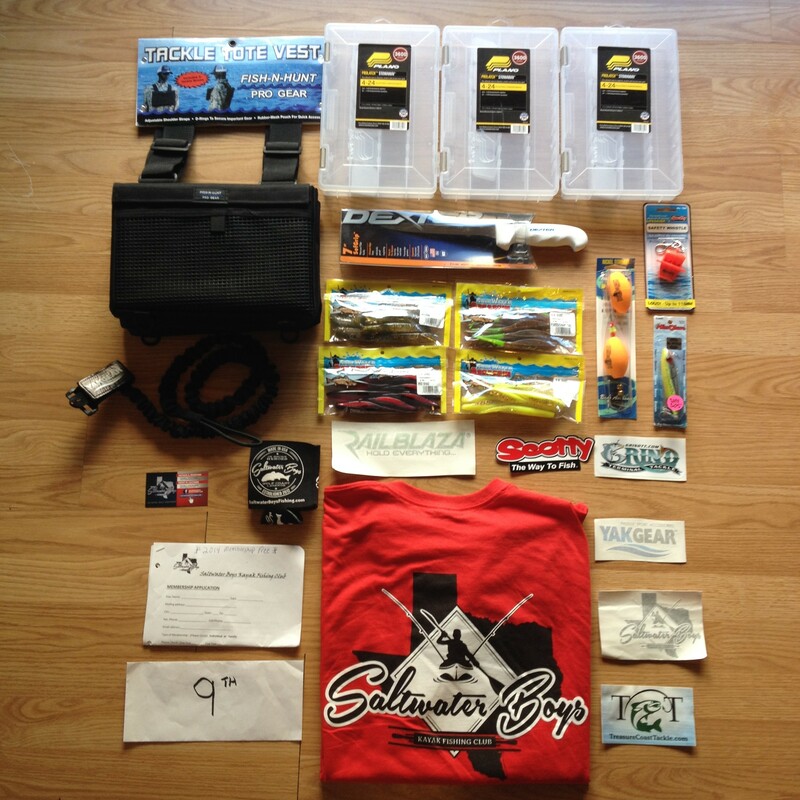 My 24″ fish had 9 spots so I won that prize package which included a one year membership to Saltwater Boys Kayak Fishing Club, a koozie, T-shirt, and a Grind Terminal Tackle Stringer. I have been meaning to register with the Saltwater Boys Kayak Club for a while but never got around to it. They are a fishing club located in the Beaumont area and have lots of gatherings and members only tournaments about once a month. The koozie and T-shirt come with your $25 membership fee. If you are interested in joining up you can find more information on their Facebook Page. I was 2 for 2 on prizes and didn’t think I could get any luckier. It turns out my luck hadn’t quiet run out just yet. The drawing for the Werner Paddle took place after the blackjack and spots prizes were awarded and it was for a really nice paddle. I don’t know how Jeff did it, but he brought out a Werner Paddles Bent Shaft Kalliste. This is one of Werner’s top low angle paddles that they produce. The bent shaft Kalliste weighs in at 27 oz, has full carbon blades, and retails for $475. 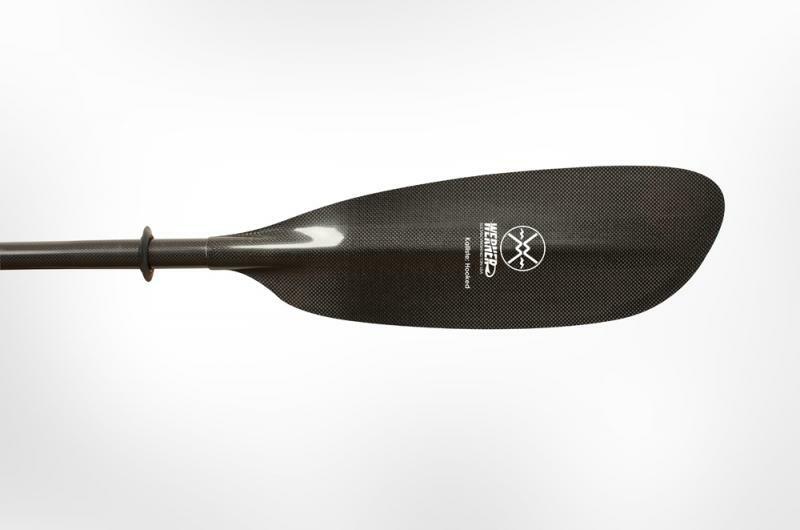 As a Werner Paddles Pro Staffer, I have never even had the opportunity to use this paddle. Jeff walked on stage and asked a young boy from the crowd to come up and draw a ticket from the box. As the young man read off the numbers I was shocked to hear him read off my number as the winner. Earlier in the day when Jeff had handed me the ticket I had already told him I wouldn’t even keep it if I won. I told him I would just give it to my friend Travis who runs the Corpus Christi Chapter of Heroes on the Water. I was pretty excited as I walked towards the stage because I was about to have the opportunity to donate an awesome paddle to a great organization. When I reached the stage I told Travis to come up and take the paddle from me because I knew he would be able to put it to good use. If you don’t know, Heroes on the Water is a non profit organization that takes current soldiers and veterans from all branches of the military kayak fishing as a way to relax and help relieve stress. Its an amazing organization that I’ve had the opportunity to help with on occasion and hope to become more involved with in the future. The video below is a short explanation about what they do. I had already won three different prizes and knew I would be receiving another. It seemed like most anglers had a tough day of fishing because not that many fish were weighed in. As Dustin came to the stage to announce the winners I waited patiently to hear my name called. Jared placed 14th and I took 9th out of 79 anglers. My 9th place prize package included $110 along with a few other prizes. It was a really fun way to start off my summer which will consists of 72 days in a row of not working and lots of fishing. The next event is not until August which gives me plenty of time to pre fish. For some reason, the August event has been my toughest one over the last two years. I’m hoping to change that this year. 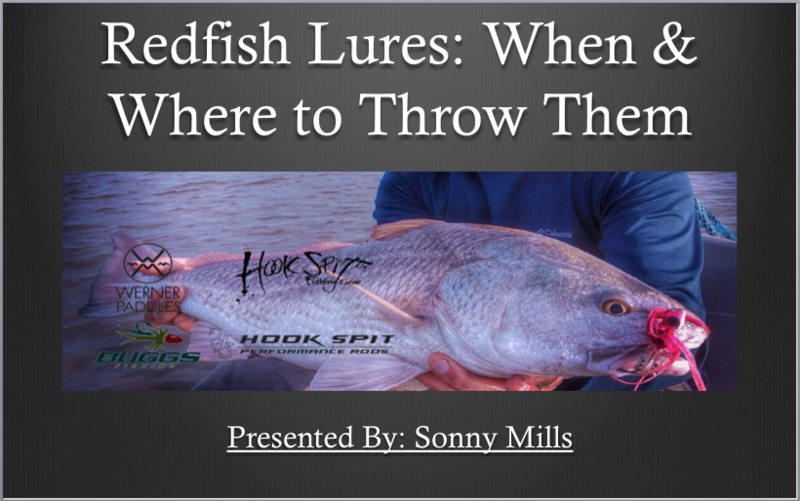 With the first day of spring approaching quickly, I’ve already started making preparations for redfish to return to the shallow marshy waters here along the Texas coast. I’ve enjoyed winter trout fishing as much as the next guy, but for me nothing beats stalking reds through a foot of muddy water on a bright sunny day. It’s a style of fishing that requires great patience and the ability to make accurate casts that I have come to enjoy more than any other. 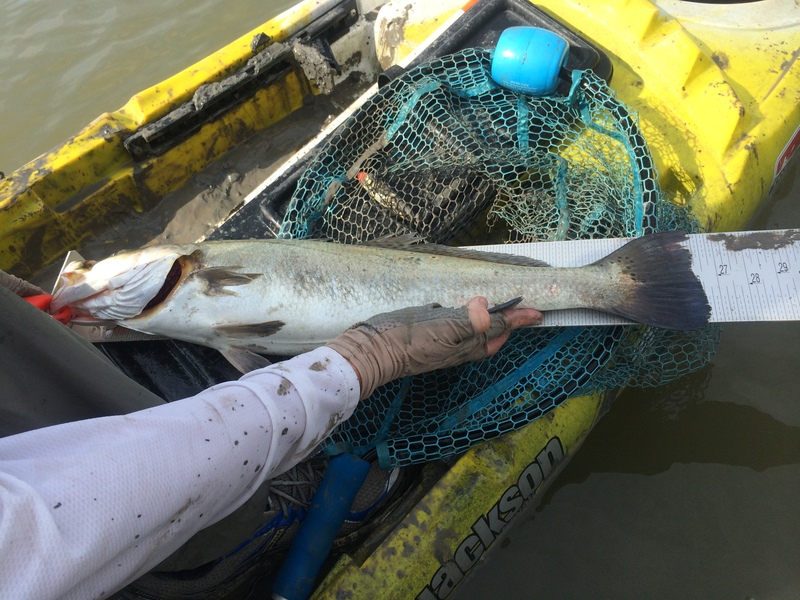 While spring tends to bring unfavorable winds that can be torture to the weekend kayaker, it also brings warmer weather and an abundance of bait. It’s a time of the year that many anglers welcome with open arms. Over the last couple of days I’ve been going through my gear to see what tackle needs to be transferred from storage to the kayak. With so many choices between soft plastics, twitch baits, topwaters, spoons, crankbaits, and numerous other lures, deciding what to bring is always a tough choice. Like most people, I have a few favorites that I never leave home without during the warmer months. Each one serves a specific purpose depending on the area or type of structure I’m fishing along with what the fish seem to want on that particular day. They are lures I have used in the past with great success and as a result I have developed great confidence in each of them. That confidence is the main reason they work so well for me. When I tie one on, I know that it’s capable of producing and expect it to catch fish. 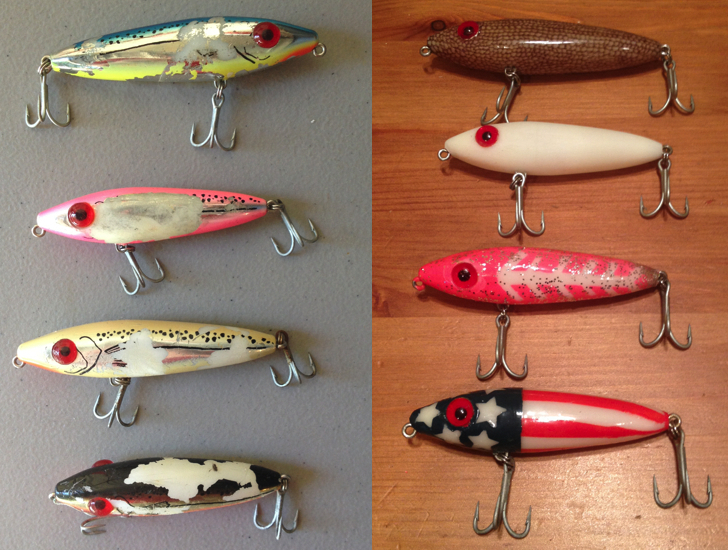 Listed below are those five lures and the reasons why I never fish the marsh without them. 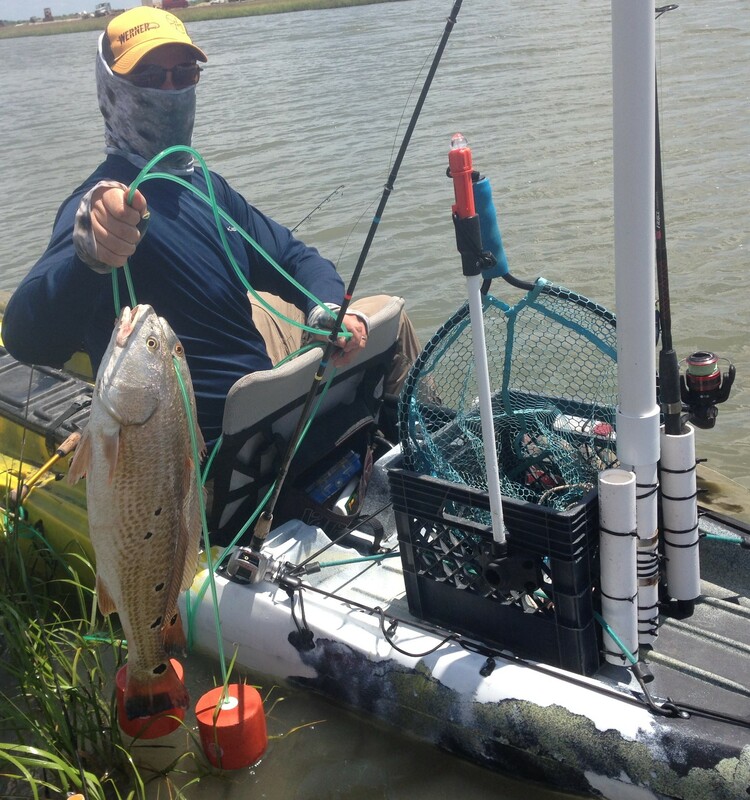 A tried and true method that has been proven to catch redfish, Gulp under a popping cork is a great way to bring the fish to you. The chugging noise created by the cork after a solid pull on your rod produces the same sound and splash a redfish makes while feeding. When nearby fish hear this, they head towards the cork and the scent from the Gulp takes care of the rest. It is a very versatile bait that casts well in the wind and allows you to fish different depths of the water depending on the length you make your leader. It works well when fished along grassy shorelines and marsh drains, but really excels when used over or around shallow clumps of oyster. Midcoast Products makes a great popping cork called the Evolution that I like to use. 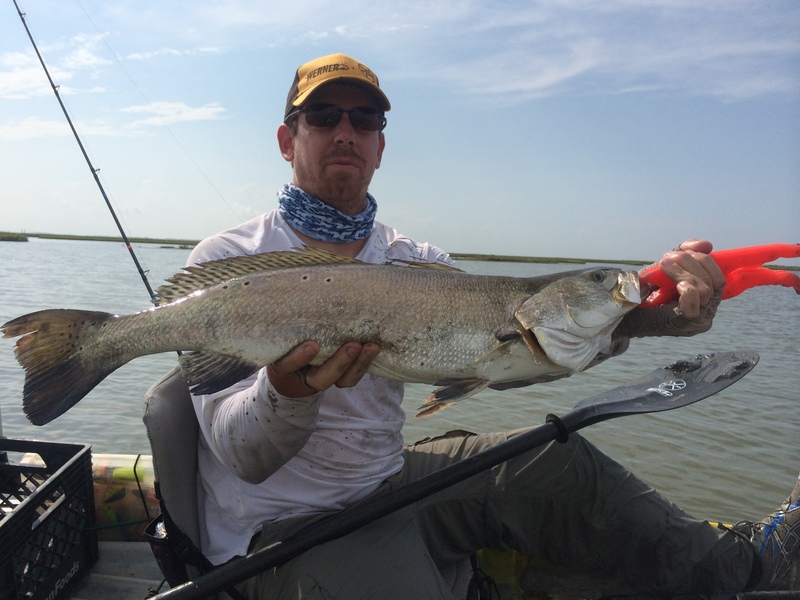 It’s a very durable cork made with a stainless steel wire that can withstand the abuse from several dozen redfish before needing to be replaced. I like to use a 1/16th ounce jighead so that after each pull on the rod, the gulp falls at a nice slow pace similar to injured or dying bait. 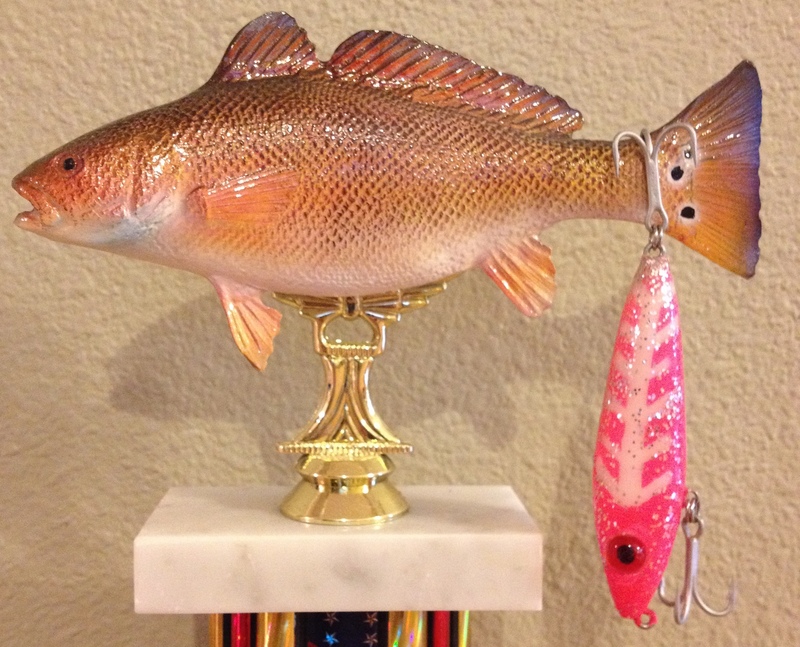 I won my first redfish tournament using the Evolution paired with a Gulp pogy to catch both of my fish. The versatility and effectiveness of this combo makes it a must have in your tackle box. When it comes to fishing, everyone loves a good topwater bite. What makes it even more exciting is the ability to see that big wake appear behind your lure before the fish explodes on to your bait. While the hookup ratio may not always be great, the thrill of multiple attacks in a single cast is enough to keep most of us from switching lures. While it’s a fun bait to throw, it is also a great lure when fishing near oyster and grass that lies just below the surface. Its ability to stay on top of the water allows you to fish it in areas where underwater grass and shell tend to be a problem for other lures. The walk the dog movement can be retrieved at different speeds and does a great job of imitating an injured baitfish. 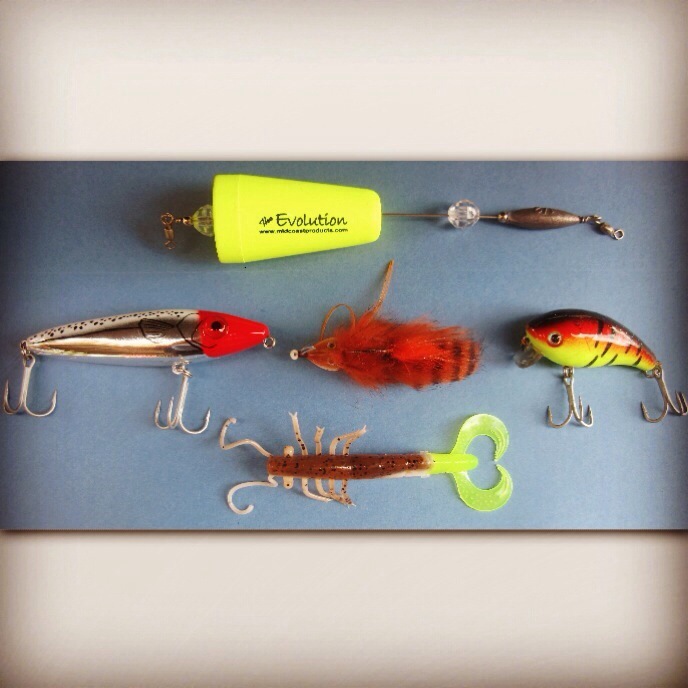 The noise from the rattles and small splashes made are great ways to help fish locate your bait. I like to keep a topwater tied to one of my rods on most trips. I may not use it every time out, but like to have one available if the opportunity presents itself. I’ve experimented with a dozen brands of topwaters and the one that I’ve had the most success with is the MirrOLure She Dog. It’s conveniently priced and comes in two additional sizes. I normally use the She Dog (4 inches) but will switch to a She Pup (3.5 inches) if I’m getting lots of short strikes. There is also a He Dog (4.75 inches) that works well on windy days when the water gets choppy. The high frequency rattles do a great job of enticing fish to eat on really slow days. 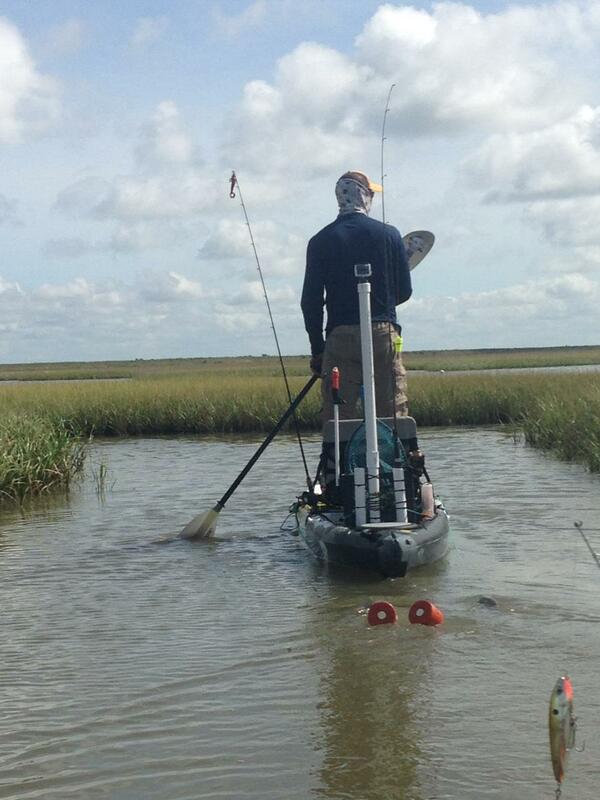 One of my favorite things about kayak fishing is the ability to go where most others can’t. Paddling through water that’s less than a foot deep in search of skinny water reds has become my favorite way of fishing. While finding tailing or backing reds in the spring is exciting, it can also be down right frustrating at times. Most of these fish have spent the last few months in slightly deeper areas so it takes them a month or two before they become more comfortable with the shallow water lifestyle again. Splashes from larger baits can easily spook fish making it difficult to convince one to eat of many days. 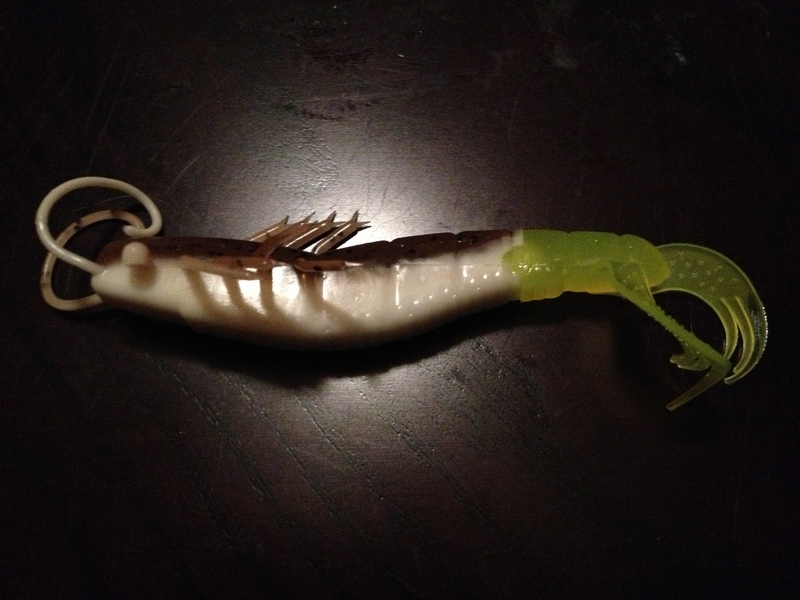 I used soft plastics for a while before discovering Buggs Lures. These lightweight lures are made locally in the Houston area and tied like flies using a special jighead that always lands with the hook facing up. They are one of the softest landing baits I have found making them perfect for shallow water reds. The bunny fur used on these lures undulates with the movement of the water while waiting to be found giving it life like qualities. 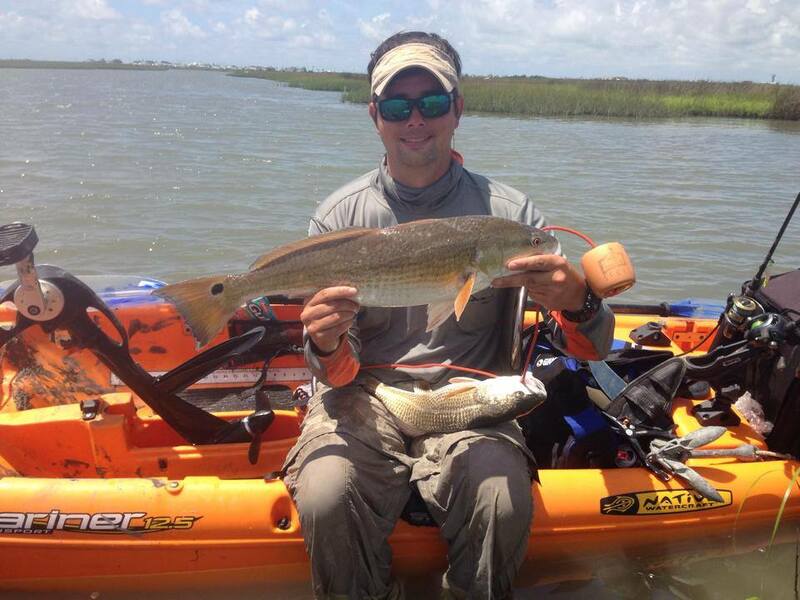 It usually requires just a few small twitches or a slow drag across a muddy bottom and redfish are all over it. My favorite Bugg is a Beastie Bugg in the 1/4-ounce size. The 1/8-ounce size is great on days with little or no wind while the 3/8-ounce is good for windy days or while fishing deeper areas. As far as sight casting baits go, it is always my first choice. Soft plastics are baits that I carry with me year round. 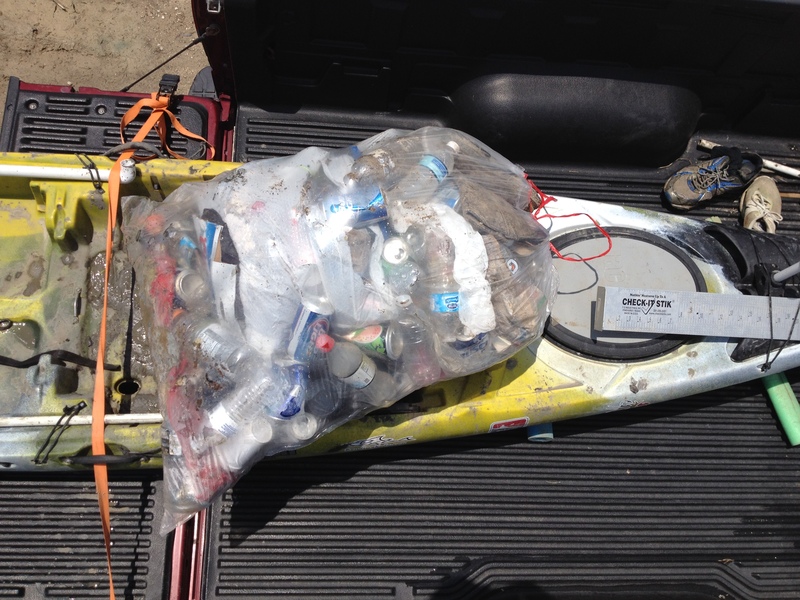 The brand, size, and style may change from season to season, but some form of soft plastic is always available on my kayak. While I don’t use them much in the winter, Chicken Boy Shrimp have become my favorite soft plastic to use during the spring, summer, and fall. Another locally produced bait from the Houston area, this bait works well when redfish are keyed in on shrimp. It is a very durable soft plastics capable of withstanding multiple fish before needing to be switched out. They work well when bounced along the bottom or reeled in at a steady pace. On a windy day when I’m having trouble accurately casting a Bugg, this becomes my sight-casting lure paired with a 1/6th ounce jighead. 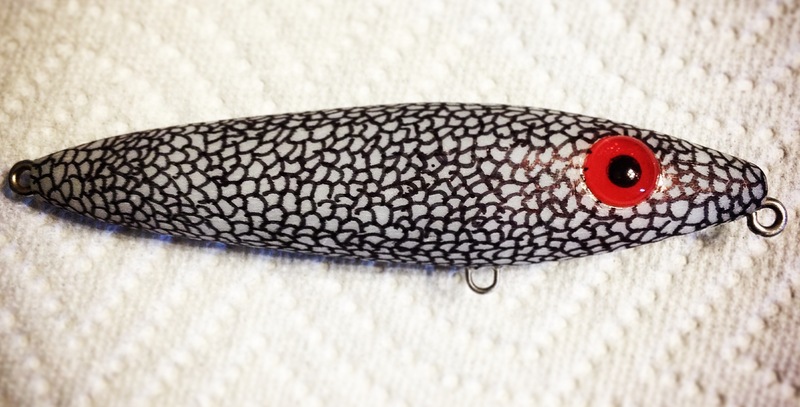 If I were only allowed one soft plastic to use year round, this would be my top choice. The Manns 1-Minus is the best subsurface search bait I have found for fishing shallow water. At top speed this bait will dive to a maximum depth of 1 foot and if reeled at a slower pace will only dive an inch or two deep. The advantage here is that you can still fish below the surface but do not have to worry about hanging up on grass or shell bottoms. It puts off great vibrations and allows me to quickly cover a small marsh lake or cove thoroughly in a matter of minutes. It’s also a great bait for beginners or children because all it requires is a steady retrieve at the speed of your choice. I have purchased several of these crankbaits in the past and all have come with freshwater hooks that will require changing. Once the hooks have been exchanged, these little guys are ready to go and redfish will crush them. These five lures are proven winners in my book. With them, I feel like I’m prepared for any situation that could possibly arise while chasing reds during the spring season. 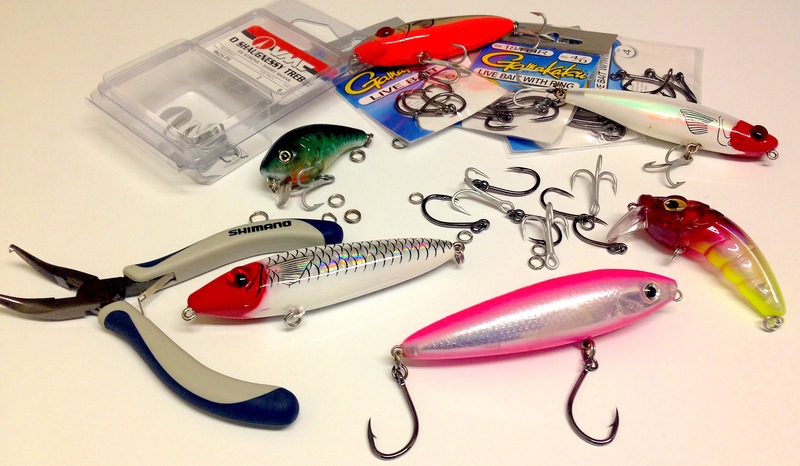 I’m always open to trying new lures, but will carry these five with me at all times over the next several months.